Question: Please tell us about your oral closing statement at the Supreme Administrative Court on 9 July 2013. What was the atmosphere like in the court room? Answer: In my oral closing statement I respectfully reminded the Court that I had asked my lawyer to submit a written statement to it since 30 January 2013, and the accused party did not object to this act. But the Court did not refer at all to my written statement in its case summary of facts, which was sent to me on 31 May 2013. This may serve as a legal precedent for the Supreme Administrative Court’s decision. It seemed that the Administrative Court of First Instance did not take the aforementioned Supreme Court’s decision seriously. I felt that it acted like a defender of state officials more than that of freedom-loving citizens. 2) The first accused party alleged that my book disturbed public order citing Article 9 of the 1941 Printing Act. A crucial point is that the book was first published in 2006. One full year had elapsed before I was charged with lese majeste. During 2006-7 there was no evidence that the book caused public disorder or moral degradation. Also the book did not trigger a public uproar against me. On the contrary, several state and private universities as well as organizations and institutions in society invited me to give lectures or share my knowledge—a role I have consistently performed for more than 50 years. If the accused party cannot counter-argue this fact then it shows that the charge pressed against me is unfounded. If the Supreme Administrative Court takes these two points into consideration, then I am confident of receiving justice. In any case, I believe that the reasoning of the Supreme Administrative Court will be as sound as that of Supreme Court or the Attorney General. 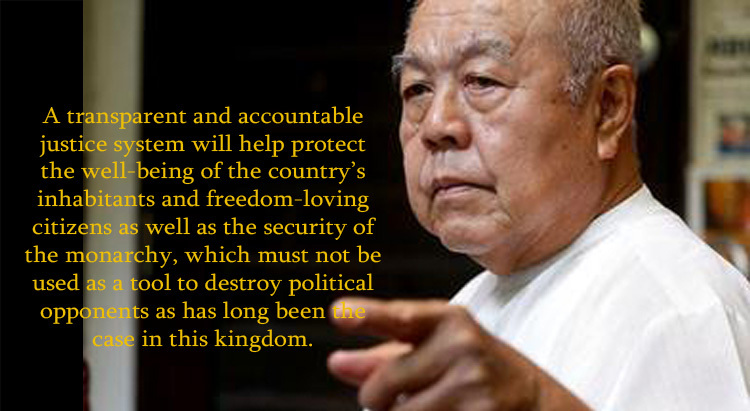 A transparent and accountable justice system will help protect the well-being of the country’s inhabitants and freedom-loving citizens as well as the security of the monarchy, which must not be used as a tool to destroy political opponents as has long been the case in this kingdom.